Other ingredients: Calcium carbonate, vegetable cellulose, vegetable stearic acid, silica, vanillin. . Directions: Adults, take two (2) tablets before or after meals. 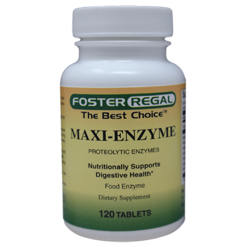 This product contains natural enzymes that sometimes have a distinctive odor. Contains: NO Artifical Color or Sweetener, NO Preservatives, NO Sugar, NO Soy, NO Yeast, NO Fish, and is Sodium Free.